I really try to not care about if I'm tan or not anymore, unlike back in high school when a fake tan was pretty essential to pair with your Hollister t-shirt if you wanted to be 'cool' (yikes). But this winter I've felt especially pasty and desperately needed a bit of color and a 'glow' for our engagement pictures a few weeks ago! I splurged on Fake Bake for $25 at Ulta (yes, this is a beauty splurge for me), and after using it several times I've realized it was so worth it! It comes with 2 different lids, and I use the spray top to get the most even, light application. Another difference-maker is that it comes with an application mitt, onto which you spray the self tanner, and then apply in a circular motion. I have never had one streak or uneven area! It's a miracle worker. Trust me on this. Around Christmas I was experiencing extreme dryness around my eyes, which was causing my concealer to cake up horribly. As a former oily-faced, pimple-stricken teen, this was a completely new concept to me. I knew of Aquaphor's healing powers because my sister, a college swimmer, has always used it for swimsuit chafing on her ribcage. I tried it around my eyes and within 2 days the problem was 100% solved. Now I'm just in maintenance mode, and apply it around my eyes, bottom of my nose, and my chin a couple of nights a week before bed. I'm not "one of those people" that exfoliates consistently by any means, but exfoliation can feel SO GOOD in the dry winter months. This body wash smells heavenly and tropical, and is still creamy enough to not be too tough on your skin. I love using this after sweaty workouts because I feel like it really gets off the sweat and makes me smell yummy again. Oh, and did I mention it's only $3.48 at Walmart?! This is a classic beauty item, and for good reason. This is the best stuff I've found to stay on my lips for a long time, and to actually moisturize them. I've had my beat-up little tin for a couple of years now, and it's lasted me that long with using it every single night before bed. It's really the best... I could go on and on about it. 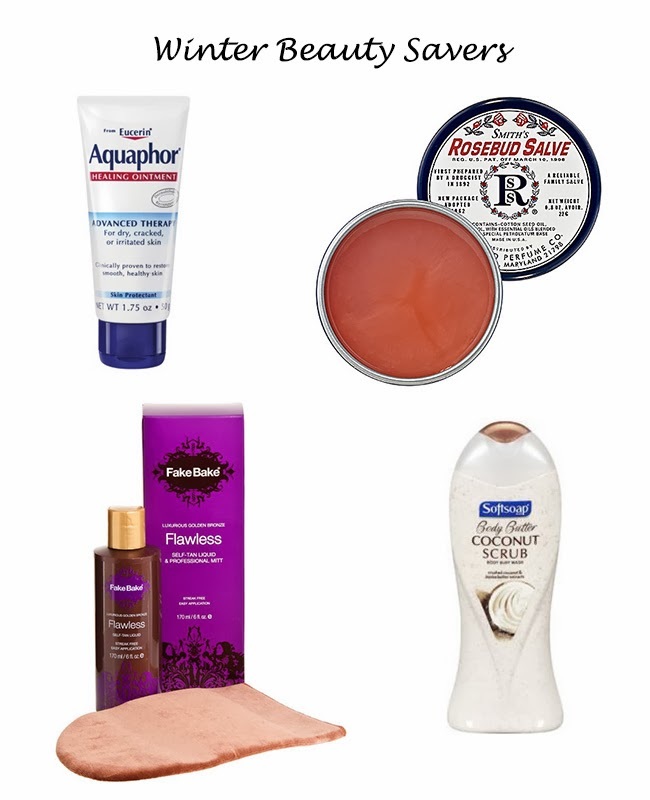 What are some of your winter beauty-savers?? I LOVE and swear by this FakeBake self tanner, this one in particular!! It gives a nice natural tan and doesn't make you orange!! Bonus!! i need some of that fake bake in my life!! so white, its embarrassing!! !